Wellness is located at the intersection of Contentment and Aspiration. To live there, you must first choose to move out of the Village of Someday. What follows is a seven-part essay on work/life balance. While the basic information applies to everyone who accepts pay in exchange for effort, the focus of this essay is on the skills needed to emotionally, physically, spiritually, intellectually, socially and financially thrive in a fast-paced, early stage, entrepreneurial and intrapreneurial venture. …when I was the CEO of the Health and Wellness Institute, I had this photo blown up and hung in our main conference room. Let me tell you why. 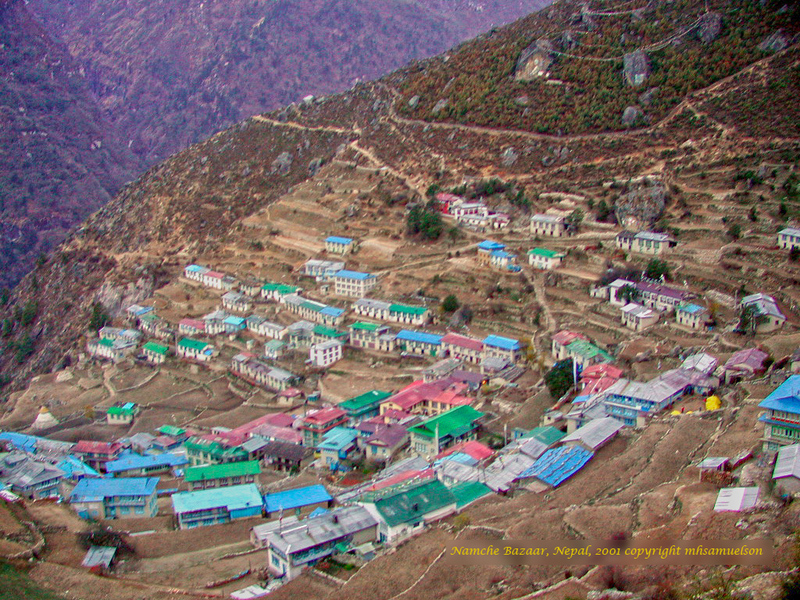 Back in 2001, I was on a 14-day trek that would take me from Lukla to the Mt. Everest basecamp and the summit of Mt. Kalapathar, in Nepal. And, no, I didn’t summit Mt. Everest, nor did I attempt to do so. The trek to basecamp and the pre-dawn scramble up Kalapathar was plenty enough challenge and quest for me, thank you. The mountain and glacier views were spectacular, of course, but it was Nepalese and Tibetan cultures and people that made the trip awesome (true sense), a true once-in-a-lifetime adventure! This is not the time or place to tell you about all of my adventures on the road to Mt. Everest but it is, in the spirit of The Reader’s Digest, the perfect place to tell you about one of “My Most Unforgettable” characters. Tenzing is the name of the young man pictured, above. I took this picture after he rested on his 27 mile journey from Tingri, a small border village in Tibet, to Namche Bazaar, a trading center in the High Kumbu region of Nepal. 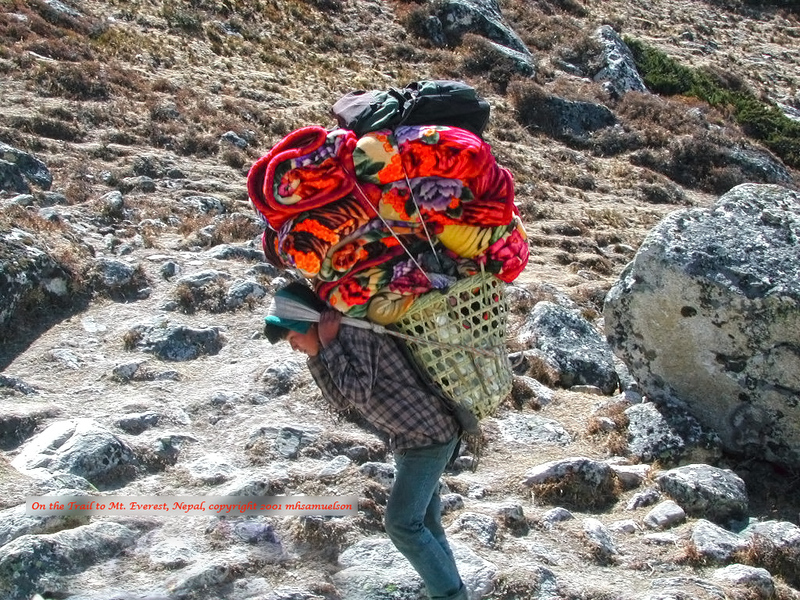 The basket of blankets—with his gear on top—weighed approximately 50 kilos (~110 lbs). Checkout the moonscape. Tenzing was fifteen years old. He was wearing flip-flops. When I met him, he smiled, bowed, and wished me, “Namaste.” While we talked (translated by Ang Nima Sherpa) he smiled and laughed. As he started back on his journey he smiled, bowed, wished me “Namaste,” and started singing. Tenzing didn’t know he was miserable. He didn’t know he was working. In the language of the High Kumbu there is no word for “work.” There is only life and living. Trading blankets is what he did, his home was wherever he happened to be at the moment (Buddhist), his community was whomever he met on his journey. The only balance he was concerned about was strapped to his forehead. “Work/Life Balance” is a western construct. It is both a blessing and a curse birthed from affluence and comfort. It suggests a paradox of duality; a dichotomy, a plural world of singular opposites that we must identify, separate, divvy and balance. What nonsense. Yet, it is our nonsense so we must deal with it. And, so we will. The underlining theme of this article is “Choice.” And, yes, you do have a choice. We may not be able to control circumstance, but we can control choice. This article is divided into seven parts and includes some opportunities for self-reflection. The reflection is, of course, up to you. Remember, it’s all about choice. You can choose to be like Tenzing and whistle and sing while you work live or you can moan and complain. Like I said, it’s up to you. Part I: First, I Must Choose to Wake Up! Part II: What is My Mission in Life, What Do I Choose to Stand For? Part III: How Do I Currently Choose to Advance My Thrival and Wellbeing? Part IV: If life Gave Me a “Do Over” What Would I Choose to Do Over? Part V: Once I Choose a Goal, What’s the Likelihood that I’ll Stay with It? Part VI: How Do I Validate and Support the Goals that I Choose?